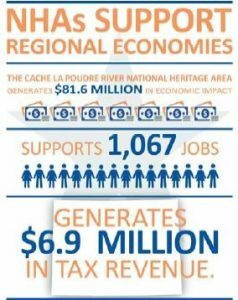 The Poudre Heritage Alliance (PHA) commissioned a study in Spring 2017 that would analyze the Cache la Poudre River National Heritage Area’s (CALA) economic impact on Larimer and Weld Counties. The results were very impressive, with the Heritage Area accounting for an annual economic boost of $81.6 million, supporting 1,067 jobs, and generating $6.9 million in tax revenues. Tripp Umbach, who did the 2017 assessment of CALA based on data from 2014-2016, has completed comprehensive economic impact studies for 15 NHA sites across the U.S. CALA’s four main economic drivers include tourism surrounding the river itself, operations of PHA and its partner organizations, grant-making efforts, and capital projects. The top economic impact sectors were hotels/motels, full-service restaurants, limited-service restaurants, and other amusement/recreation industries. Click here to view the full economic impact study. However, PHA and CALA are under threat from demands on water, insufficient federal appropriations, the need to raise awareness about water management, rising human health and safety concerns, a generation more connected to their technology than to the natural world, and the loss of history and heritage over time. As the giving season approaches, please consider the Poudre Heritage Alliance and the Cache la Poudre River National Heritage Area as a worthy charitable cause. You can schedule your Colorado Gives donation here. Donations must be scheduled before Tuesday December 5th to qualify for the Community Foundation’s matching program. More about CALA and PHA: The Cache la Poudre River National Heritage Area is one of 49 National Heritage Areas (NHA) in the United States. NHAs are places where natural, cultural, historic, and scenic resources combine to form a cohesive, nationally distinctive landscape arising from patterns of human activity shaped by geography. CALA stretches 45 miles along the curves and bends of the hard-working Poudre River from the eastern border of the rugged Roosevelt National Forest, down through the blossoming cities of Fort Collins, Windsor, and Greeley, until the vital water resource conjoins with the South Platte River in the Colorado eastern plains. As the managing organization behind CALA, the Poudre Heritage Alliance serves the local communities of Larimer and Weld County by building a deeper understanding of the Poudre River’s national significance as it relates to water law and water management. PHA and CALA bring together residents, private organizations, and government entities behind this common goal, while also enticing tourists with the recreational, environmental, and historical points of interest throughout the Heritage Area. PHA programs and initiatives that support these efforts include volunteer trainings, grant-funded projects, and outreach events that help educate people about water history and the importance of the Poudre River corridor today. For more information about PHA or CALA, please contact the Poudre Heritage Alliance Office at admin@poudreheritage.org or 970-295-4851.